Malcolm Daly, an adventurer to the core and an outdoorsman par excellence, has devoted his life to making outdoor activities available to the people with physical disabilties. Although Daly isn’t the easiest person to reach since he’s usually in remote and rugged regions pursuing “off-the-grid” outdoor activities, he will speak at Land Rover Las Vegas at 6 p.m. on May 20. Daly, who lost a foot to frost bite after a climbing accident in Alaska in 1999, is the executive director of Paradox Sports, a company that strives to help people, regardless of background or disability, participate in human-powered sports. Daly dedicates himself to lessening the physical and financial obstacles that often exclude people with disabilities from participating in outdoor sports. 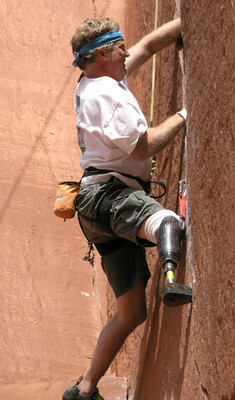 Paradox Sports helps wounded veterans, people with congenital amputations, paraplegics, climbers who have lost limbs and others participate in sports such as mountain climbing, skiing, biking, paddling, surfing and hiking. Land Rover Las Vegas is located at 5255 W. Sahara Ave. You can reach it by calling 579-0400 or visiting it online at www.lrlv.com.